Terrell Unit is a medium to low security prison located in Rosharon Texas, part of Brazoria County. Terrell Unit houses up to 1,603 male inmates (1,389 in the main unit and an additional 214 in the Trusty Camp). The facility is named after insurance executive Charles Terrell, and is co-located with other units that make up the Ramsey Complex. 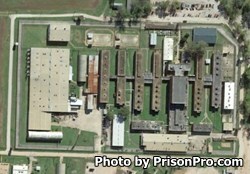 The main building of Terrell Unit was built in 1983 and houses 1,055 inmates considered general population. An additional 31 segregation beds, and 12 infirmary beds are located in the main building. The Trustee Camp which generally houses minimum security offenders was built in 1987 and can house an additional 214 inmates. The expansion unit was built in 1994 and enabled an additional 334 inmates to be incarcerated at the Terrell Unit. Inmates at the Terrell Unit range in age from 20 to 77 years old. Offenders can participate in a variety of work assignments which include facility maintenance, mechanical shop, a cow/calf operation, farming edible crops, cotton gin operation, and in the production/finishing of swine. Inmates are provided literacy courses, adult basic education classes, GED courses, life skills, and substance abuse education during their incarceration. Additionally, a pre-release course called CHANGES is provided to any offender who is nearing their parole eligibility/release date. Vocational training is provided to teach offenders new skills in welding and the electrical trade. All visitors must be on the inmate's approved visitation list, additionally the visitor's address that the inmate submitted must match the address on the visitor's identification. Terrell Unit conducts visitation on Saturdays and Sundays from 8am to 5pm. Visitors are allowed to bring a small clear Ziploc bag with up to twenty dollars in quarters to purchase items from the visiting room vending machines. Cell phones are not allowed inside the facility at any time, leave cell phones in your car.